On September 25th I was apart of the Moja Arts festival juried art exhibition. 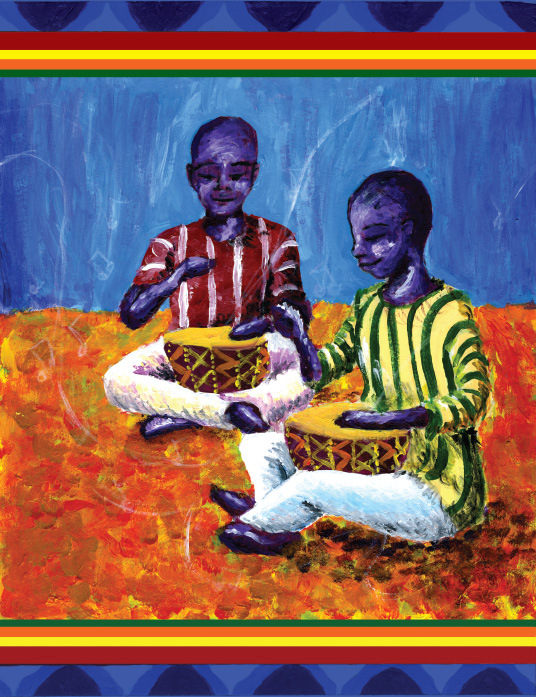 The Moja Arts festival is held every year in Charleston, SC and is a celebration of African-American and Caribbean arts. There are a wide range of activities that are held during the Moja Arts Festival. I am a native of Charleston, SC so I was absolutely ecstatic to be a part of the festival this year. This painting is a depiction of the drummers that participate in a dance known as Abang. This dance is native only to the Ibibio tribe in the Akwa Ibom State of Nigeria. The purpose of this dance along with all Nigerian dances is to preserve and reflect the history and culture of the tribe. My father was my source and inspiration for creating my paintings, which gave me a wonderful chance to learn more about him and the tribe that I am a part of. Here is a short description of the dance. The dance is done by a group of four or five girls between the ages of four to sixteen years old. Two or three boys accompany the girls by playing the drums behind them. The oldest girl is considered the main abang. She is the essence of womanhood and the mother of the group. The whole group goes from house to house dancing, singing, and playing the drums. By doing so they are uplifting each household. In return the group is given gifts by the families of each household. These gifts are usually in the form of money, and placed in a plate on the ground. Abang is held every year during the Ukabade Isua, which means the end or turn of the year. Since the acceptance of Christianity in to the culture it is now held during Christmas time. I created a small illustrated book to describe the dance. So this painting is just one of the several paintings that gives a glimpse of the dance . My interpretation my not be fully accurate, but I know that my father was greatly touched and really enjoyed book. Last Thursday was our first critique of the shoulder assignment in my anatomical visualization class. With this project I was required to draw to shoulder girdle from an anterior viewpoint and a posterior viewpoint using a provided model, and bones from our bone boxes. On the anterior viewpoint I needed to find an appropriate view that best displayed the acromioclavicular ligament, the coracoclavicular ligament, and the coracoacromial ligament. For the posterior view I needed to find an appropriate view that best displayed the supraspinatus muscle, the infraspinatus muscle, and the teres minor muscle. What I found frustrating at first with this project was the use of a clear piece of plexiglass that represented our picture plane, as well as the paper I was drawing on. In this project I was also required to use a divider to get accurate measurements of what I was truly seeing. What made me frustrated was that what I was actually seeing did not match in the way I thought it should in my drawing. I felt that my scapula on my anterior view was too small, but in reality it was a true measurement. On my posterior view my scapula can not easily be seen underneath the muscle, but I also felt that the shape of the scapula was wrong. I ended up doing both drawings over due to my frustrations, but I found the second time that I drew the shoulder much more enjoyable. I accepted that want I was drawing my measurement was truly there. Overall, working in this manner of taking accurate measurements really made me realize that we often draw what we think we see and not what we truly see. Finding the appropriate shape of the ligaments on the anterior view proved to be a journey in search of accurate information. In several books that I used as references I found that many illustrations of the ligaments were not done completely accurate. This also proved to be true as I searched online. The best way to illustrate the ligaments was discussed in our critique. It was to read about where the ligaments attach and consider the action of what those ligaments do, and draw accordingly. What I took from the critique was that drawing accurately does take time and patience, and requires that you use as many resources as possible. I am a first year graduate student at UIC in the Biomedical Visualization program. I have experienced many new things in just moving to Chicago to go to school. Dissecting a cadaver in my anatomy class has been one of those new experiences. I have done several dissections in biology classes as an undergraduate, but never an actual cadaver. It is strange to dissect another human being, but even so I continue to find myself fascinated by all that we are discovering. I will be forever grateful to the person who donated their body for the sake of increasing my knowledge of the human body, and I will treat their body with the respect that they deserve.